O’Toole’s offers a wide variety of banquet food and drink packages for your party or event. What is The Back Room at O’Toole’s? The Back Room at O’Toole’s is O’Toole’s new banquet facility in Albany. The banquet hall is attached to O’Toole’s Restaurant Pub but can be closed to make it a perfect location for your private party or gathering. It’s a great location for a birthday party, corporate event, retirement party, rehearsal dinner or other other banquet. Have a party with over 50 guests? No problem. We can accommodate parties up to 100 guests for a seated meal or up to 150 guests for cocktails. 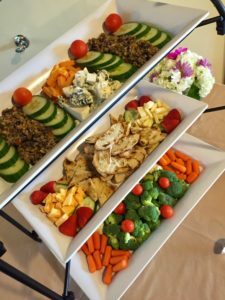 View our banquet food options below, see the full catering menu or let us be creative and design a food and drink package that is tailored for you. Choose a budget and let us present an incredible night of banquet food and drink for you and your guests. Consumption bar and cash bar options available. Domestic beer and house wine only. Call liquor, domestic beer, house wine, bottled soda. Premium liquor, beer and wine. Chef’s choice of assorted breakfast breads, bagels, butter, cream cheese and seasonal fruit. Freshly brewed coffee, assorted teas, orange and cranberry juice. Gravlax may be added at an additional cost. Chef’s choice of assorted breakfast breads and bagels, butter, cream cheese and seasonal fruit. Fresh scrambled eggs, smoked bacon or sausage links and home-style potatoes. Omelet Station – Chef attended. Made to order with plenty of meats, vegetables and cheeses. Pancake Station – Cooked to order pancakes with assorted garnishes. Accompanied with warm syrup and butter and whipped cream. Brunch Buffet includes house salad with ranch and Italian dressing, rolls with butter, Chef’s choice of assorted breakfast breads and bagels, butter, cream cheese and seasonal fruit. Fresh scrambled eggs smoked bacon and sausage links with home-style potatoes. Gravlax available at an additional cost. Lunch buffet comes with either a hot or cold entree. Or, you may choose both for an additional cost. Boxed and express lunch options available. Custom catering any items available (pick up only). A platter of freshly sliced ham, turkey and roast beef. Assorted cheeses, sliced breads, lettuce, tomato and onion. House salad with rand and italian dressing. Coffee, tea and soda included. Includes house salad with ranch or Italian dressing, fresh rolls and butter. Includes house salad with ranch and Italian dressings, seasonal vegetables and fresh dinner rolls with butter. Also includes coffee, assorted teas and soda. Dessert can be added to any package at an additional charge. Includes two pasta, two meats, two sauces and plenty of vegetables and cheeses. Nachos, chili, cheese with salsa and sour cream on the side. We have many packages to customize your event. Special Requests: We can prepare any food item within reason. Usually with no additional cost. We specialize in gluten free and can meet any allergy or vegan concerns. If you would like something that you don’t see, please ask us. We will be glad to accommodate. In addition, our culinary team can create “themed” banquet food buffets for your event including Italian, Caribbean, Mexican, Southern style, Japanese, BBQ and more. All will make your event extra special. Banquet menu options start at $20 per person for food. There is a minimum total spend required. This is based on the date, the day and the time of the event. All prices are subject to an 8% sales tax, 17% labor fee and 3% admin fee. The fees are in addition to the minimum spend and unfortunately are non-negotiable. Gratuity is NOT required. The labor fee (not gratuity) covers the several staff members who prepare and maintain your event before, during and after. Our service staff is paid a competitive rate, but will always welcome “any” additional gratuity for making your event beyond exceptional. To hold your date, a $300 non refundable deposit is required. This will be deducted from the total the day of the event. A $200 Room rental fee (non-negotiable) is required for a private event. Room rental is based on 4 hours ($75 for each additional hr) Room rental includes standard linens and napkins plus use of the entire facility and all of its amenities. Special colored linens are available for an additional fee. All prices listed are subject to change unless we have received both a $300 deposit and a signed final agreement. We do allow table decorations. However, no stapling, tacking of décor to any area of the Backroom (Unless first approved by the coordinator). Confetti is subject to a $50 cleaning fee. Any damages done by negligence, or other fees will be negotiated and taken from the deposit at the end of the event. A final count is needed 10 days before the event and again during the event. This determines the final price (whichever is higher). If the guest count is too low, we reserve the right to charge the minimum spend negotiated on the contract. Outside event catering is allowed provided the room minimum is met. The Food Caterer must be licensed & insured. No outside alcoholic beverages are allowed. We can arrange any special requests that may or may not include a charge.